The Huawei P30 and Huawei P30 Pro are official, and seem to be impressing everyone who gets hands on them – particular when it comes to the photographic capabilities. But how does the Pro model shape up against last year's Huawei P20 Pro? We're about to tell you. 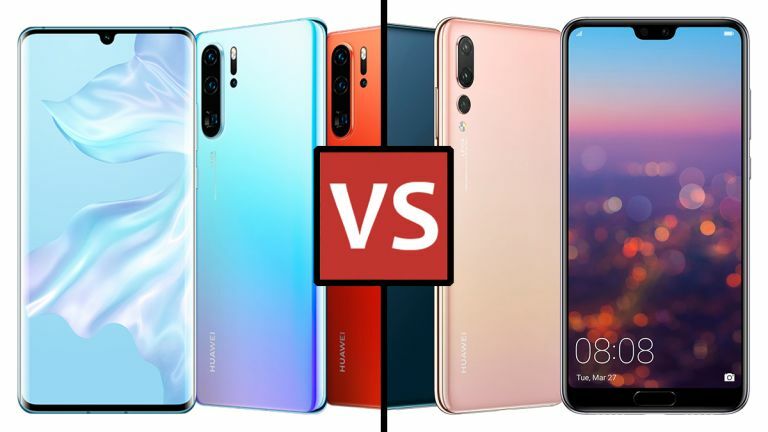 Here we're going to compare the Huawei P30 Pro against the Huawei P20 Pro in all the key areas you look at when weighing up a smartphone purchase: the specs, the overall design, the power and performance, the camera photo quality, and all the other features of note. The Huawei P30 Pro has had the benefit of an extra 12 months of refinement and improvement, and it shows – smartphone design in general is just in a better place in 2019 than it was in 2018, and that applies to Huawei too. Don't get us wrong – the P20 Pro is a good-looking phone. But the P30 Pro has smaller bezels, a smaller notch, and no fingerprint sensor cluttering up the back of the device (it's under the screen instead). You get more screen real estate with the Huawei P30 Pro as well – 6.47 inches instead of 6.1 inches. There are a few extra pixels on the new phone too, 1,080 x 2,340 of them as opposed to 1,080 x 2,240 of them on the P20 Pro. Both phones come in a selection of appealing gradient colours, as well as more basic colour options, so you should be able to find something that matches your own personal style whichever one you go for. As with the design of these phones, the Huawei P30 Pro has the advantage of an extra year of phone evolution – it's the more powerful of the two, as you would expect, but if you're thinking of upgrading then the leap isn't a massive one. Under the hood of the Huawei P20 Pro we've got the Kirin 970 made by Huawei itself, and that's coupled with either 6GB or 8GB of RAM, and either 64GB, 128GB or 256GB of internal storage. There's no memory card slot on board to expand that storage either. As for the Huawei P30 Pro, that comes rocking Huawei's latest Kirin 980 processor, paired with 6GB or 8GB of RAM, and either 128GB, 256GB or 512GB of internal storage. On this phone you can expand that via memory card, though only by opting for Huawei's own Nano Memory card format. Huawei says the Kirin 980 offers about a 20 percent improvement over the Kirin 970, but it's debatable how many apps would actually make use of that full 20 percent. Put it this way: the Huawei P20 Pro still has all the power you need in 2019. It's in the camera system where the Huawei P30 Pro improves most dramatically over the Huawei P20 Pro. Now the triple-lens P20 Pro had a very good camera, but the quad-lens P30 Pro seems to take it to the next level – it's particularly good in low light. The P30 Pro also ups the amount of optical zoom available from 3x to 5x. It really is one of the best cameras so far on a smartphone, and maybe the best reason to upgrade to the P30 Pro if you already own the P20 Pro. In terms of the other features offered by these phones, Huawei has now pushed out the Android 9 Pie update for the P20 Pro, so they're both running the same version of Google's mobile OS – with Huawei's own visuals and apps on top. The Huawei P30 Pro is IP68 rated for waterproofing, whereas the Huawei P20 Pro is IP67 rated – basically the newer phone can spend a little longer underwater without getting damaged. Finally, the Huawei P30 Pro adds the option of wireless charging, which isn't available on the Huawei P20 Pro. There's no doubt the Huawei P30 Pro is the better phone here – in terms of its design, and the amount of power it offers, and in the capabilities of its camera. However, it's also the more expensive, which is something else to factor in. If you're choosing between the Huawei P30 Pro and the Huawei P20 Pro for your next smartphone, we'd say the P30 Pro does enough to justify its extra cost – though as always, we'd advise you to check the latest deals and prices online to weigh up your options (you can see some of the best deals on this page). If you're thinking about upgrading from the P20 Pro to the P30 Pro, we'd say the question is a lot more difficult to answer. It really depends if you want that exceptional camera, but the camera on the P20 Pro is very good too. On balance we'd be tempted to wait for the P40 Pro to arrive. It's also fair to say the Huawei P30 Pro is likely to last you a little bit longer before it slows down, just because of that Kirin 980 processor. What both these phones show, however, is that Huawei is getting better and better at knowing how to put together a smartphone.